Ebikes are having a breakout moment as bike and bikeshare companies embrace them. After a brutal horseback riding accident, Joseph Marino Jr. felt like his freedom was gone. His days of giving horseback tours seemed over. Following his third and final surgery in the spring of 2016 — a year after the incident — Marino knew he had to change something in his life. "I used to whip around corners on horseback with the wind in my face," said 27-year-old Marino, who lives in Torrance, California. "It hurt not to have that anymore; not to feel myself riding anything." 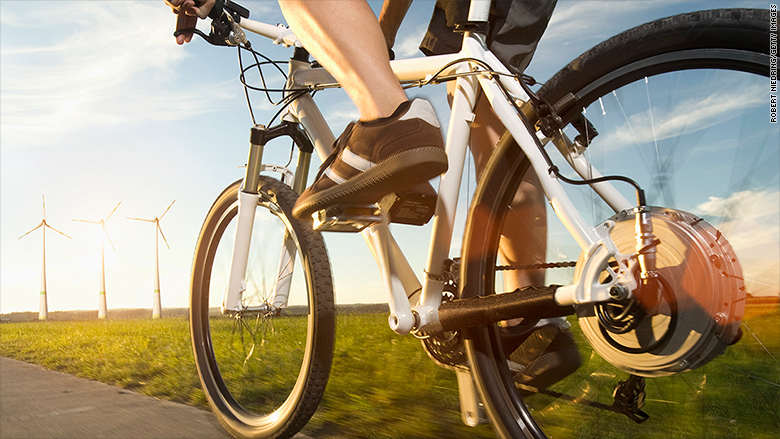 To ride an ebike, a user pedals or triggers the throttle for the electric motor, providing power to the wheels. "You honestly feel like you're floating," said Marino, who found pedaling easy for his recovering leg. "I felt like I was riding horses again. Instead of trails, I was road biking in and out of traffic." Marino stands with his ebike, which he's ridden more than 4,000 miles. "This is the beginning of a multi-year shift away from regular pedal to electric bikes," Jump Bikes CEO Ryan Rzepecki told CNN Tech. "When people first jump on an ebike, their face lights up. It's exciting and joyful in a way that you don't get from a regular bike." 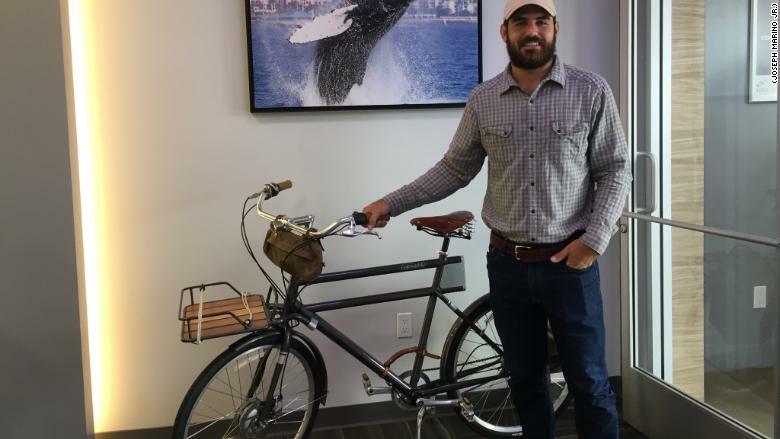 Two years ago, CEO Chris Cocalis of Pivot Cycles -- which sells high-end mountain bikes -- found that U.S. bike shops weren't interested in stocking ebikes. Some retailers warned Cocalis that they'd drop the brand if it came out with an electric bike. Some traditionalists had feared excess wear on trails, but research has since shown that not to be the case. Now that sales are taking off, the vast majority of bike dealers are asking Cocalis when he'll make an ebike available. 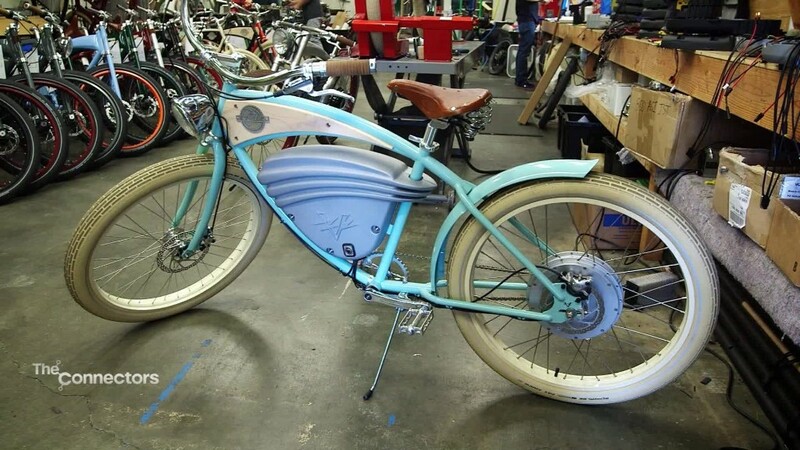 Meanwhile, Pivot Cycles sells an ebike in Europe, and has its eye on the U.S. market. "There's tremendous opportunity to get a generation of people for whom suffering isn't their thing," Cocalis said. "Ebike riders get the enjoyable part of cycling without the massive suffering of climbing huge hills."